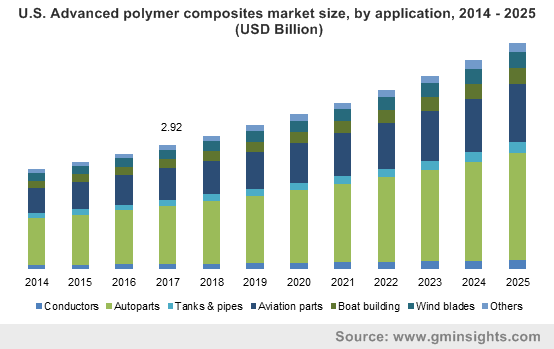 Advanced Polymer Composites Market size was over USD 9 billion in 2017 and is projected to expand at over 7.5% CAGR over the forecast timeframe. 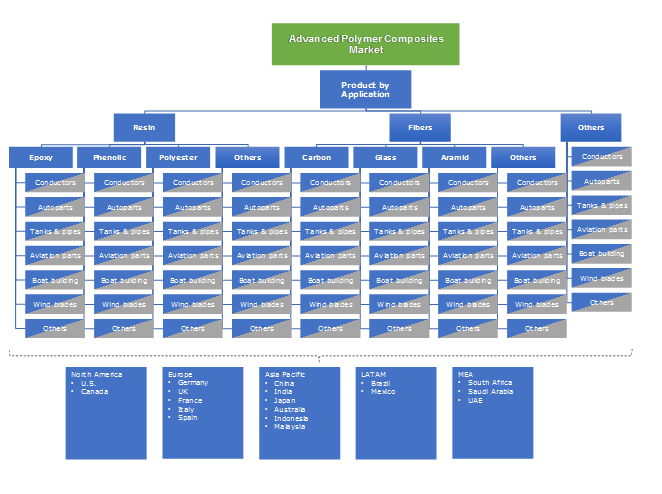 Advanced polymer composites market will be driven by the increasing product demand in automotive and aerospace industry owing to its excellent technical properties such as high strength, stiffness, excellent fatigue and abrasion resistance. These advanced composites are majorly used in making high performance super car and aircraft parts such as engine nacelles, wings, elaborators, floor beams, ailerons, rudders, landing gear doors and other components due to its excellent strength along with reduced weight, which helps in improving the operational efficiency. Rapid urbanization and improved lifestyle will propel the number of airline passengers coupled with reduced fare prices. For instance, the global air traffic is likely to witness growth over 5% by 2025. Additionally, the total large commercial aircraft delivered in 2013 was around 1200 units and is expected to surpass 1500 units by the end of the forecast period. Additionally, the industry growth will be positively influenced by escalating automobile sales in countries such as China, Japan, the U.S., etc. along with initiatives by automobile manufacturer to use polymer composites. For instance, Ford Motor is planning to build autoparts and passenger vehicles using advanced composites to improve the vehicle’s handling, acceleration, braking, efficiency and safety. High product price due to its complex production process and stringent government regulations may become a hindrance for the advanced polymer composite market in the near future. However, advanced polymer composites are increasingly finding application in wind blades manufacturing due to its high stiffness & strength and increasing product usage in the wind energy farms. Diminishing fossil fuel reserves along with its reducing dependency for energy generation and increasing awareness towards associated adverse effects has substantially propelled renewable energy sources demand over the past few years. For instance, the global installed wind capacity in 2013 was close to 300,000 MW and is likely to reach 750,000 MW by 2025. Thus, elevating renewable wind energy demand will positively impact on the total advanced polymer composites industry size by 2025. The global advanced polymer composites market size by resin was over USD 3 billion in 2017. Epoxy, phenolic and polyester are the major types of resin used in the industry. Epoxy is high performance resin with superior adhesive properties and high-water resistance, that makes it desirable for boat building operations and thus have widespread application in boat and aviation parts building. Phenolic resins possess resistance from high flame and electricity, superior mechanical strength and are used in metal bonding and carbon & electrical materials. Advanced polymer composites market share by fiber led the overall industry size in terms of revenue with a CAGR over 7.5% by 2025. The segment is further categorized into carbon, glass and aramid. Carbon fiber has excellent rigidity and high tensile strength. Therefore, these fibers are extensively used in the automotive, aerospace and marine industry. Glass fiber has additional properties such as transparency, hardness, chemical resistance, stiffness, stability and flexibility. Therefore, these are commonly used in apparels & garments, home furnishing fabrics, tires & reinforced plastics, boat hulls & seats, exhaust nozzles and production of heat sheath for aeronautical equipment and for wall paneling. The global advanced polymer composites industry share for aviation parts accounted for more than 20% of the total share in 2017. Excellent technical properties of the product make it suitable for applications in the aerospace industry. The global aviation industry, including both autoparts and passenger, is expected to experience strong gains over the projected timeframe on account of improving consumer lifestyles, which is resulting in improved air traffic in the recent years. Furthermore, increasing air transportation mode in order to reduce time required for good delivery will complement industry growth by 2024. The overall advanced polymer composites market share for autoparts will surge at over 7.5% CAGR between by 2025. Increasing automotive manufacturing and sales across the globe will subsequently boost the industry growth in the forecast timespan. The product is broadly used in the autoparts such as tires, windows, body panels, instrument panels and engines owing to its low weight, fabrication ease and flexibility. North America led the total advanced composites market size and accounted for more than 35% of the global industry share in 2017. Prevalence of huge customer base for aerospace industry is the major factor contributing towards business growth. Air traffic in the region is the highest with escalating aircraft part manufacturing operations due to the growing product demand in autoparts, civil and military aerospace applications. The region has substantial wind energy generation which is projected to boost the product demand. Additionally, the region has substantial number of customer for entertainment boats such as yachts, which may further boost industry size in the region. However, Asia Pacific is likely to observe highest growth with a CAGR over 8% by 2025. Increasing automotive sales in the region due to improved consumer spending power, elevating aerospace industry in China & India and robust growth in the boat building activities are the factors contributing regional growth over the forecast period. Advanced polymer composites market share is competitive owing to the presence of large-scale manufacturers. Prominent market share contributors are Arkema S.A., BASF SE, Owens Corning Corporation, Cristex Ltd, 3B-Fibreglass sprl, SGL Carbon SE, Solvay S.A., Kemrock Industries, Mitsubishi Rayon Co. Ltd., TPI Composites Inc., Toray Industries Inc., Koninklijke Ten Cate N.V., Hexcel Corporation and Cytec Industries Inc.
Key industry players are expanding their product portfolio by launching new and innovative products to attain competitive edge over its competitors globally. For instance, in March 2015, BASF launched a new binder – Acrodur Power 2750 X. The product is designed for the production of natural fiber composites for automotive lightweight applications such as interior car door panels or shelves. As a low-emission alternative to formaldehyde-based reactive resins, it gives a natural fiber composites high mechanical stability. Advanced polymer composites are produced by the combination of two or more different materials for achieving improved functional properties and high structural rigidness. Propelling product demand in manufacturing light weight parts used in aircrafts, wind energy farms, autoparts and boats will stimulate industry growth in the near future. North America led the overall advanced polymer composites market in 2017 due to the escalating product demand in aircraft manufacturing.